Joseph K. Perloff, MD, died at 89 years of age on 18 August 2014, at his home in Los Angeles. He was born 21 December 1924, in New Orleans, Louisiana. He received his bachelor’s degree from Tulane University in 1945 and his medical degree from Louisiana State University in 1957, graduating as a member of Alpha Omega Alpha. His internship and residency (both in pathology and internal medicine) were at Mt. Sinai Hospital in New York and were followed by a Fulbright Scholarship at the Institute of Cardiology in London. He was a cardiology fellow at Georgetown University Hospital (1956–1957) and became a member of the cardiology faculty at Georgetown Medical School in Washington, DC. There he rose through the academic ranks to become a Professor of Medicine and consultant in pediatric cardiology in 1970. He was recruited to the University of Pennsylvania in 1972 as Professor of Medicine and Pediatrics and Chief of the Cardiovascular Section (1972–1977). He was recruited in 1977 to the UCLA School of Medicine in Los Angeles, California, as Professor of Medicine and Pediatrics. Dr. Perloff had a long and close relationship with both the American Heart Association (AHA) and the American College of Cardiology (ACC). 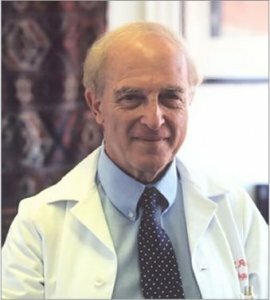 For the AHA, he was a Fellow on the Council of Clinical Cardiology, a member of the Research Study Committee, a member of the Program Committee for the National Meetings (1968–1972), and a member of the Committee on Standards for Cardiac Catheterization Laboratories. He was named “Great Teacher” by the AHA in 1977 and 1978, and “National Physician of the Year” in 1993. For the ACC, he was a member of the Board of Trustees for 3 separate terms: 1968–1971, 1972–1975, and 1983–1988. He was Chairman of the Program Committee for Master Teacher Sessions at the ACC Scientific Sessions in 1973. He received the first Lifetime Achievement Award of the ACC in 2008. At UCLA, he formed one of the first adult congenital heart disease centers in the world and was named director of the Ahmanson Adult Congenital Heart Disease Center, serving from 1980 through 1988. He also co-founded the International Society for Adult Congenital Cardiac Disease. He was a member of the Board of Examiners for the Sub-Specialty Board on Cardiovascular Diseases. Teaching was Joseph Perloff’s passion. He was awarded master teacher awards at every institution at which he worked, usually on several different occasions. He was a visiting professor at more than 100 hospitals and universities throughout the world. His widely acclaimed and highly sought textbook, The Clinical Recognition of Congenital Heart Disease, has gone through 6 editions. I first met Dr. Perloff when I attended a weekly Thursday evening cardiology teaching program held at Georgetown Medical School in the late 1960s. He taught regularly at these weekly sessions. He was passionate, very knowledgeable, articulate, always well organized, and a forceful presenter across the broad spectrum of congenital and adult cardiovascular disease. His breadth of knowledge was an inspiration to every physician, nurse, and student who attended these meetings. Later, when I was working at the Clinical Center at the National Institutes of Health in Bethesda, I invited him to come there as a consultant to see patients who had both autoimmune and cardiovascular diseases. I have never seen a more gifted educator in cardiovascular medicine. Certainly, I have never met a more determined or committed physician-educator in congenital adult heart disease. He was truly exceptional. Our country has lost a great teacher, role model, and physician. His teaching style and his remarkable book will continue to influence our care of patients and educational efforts in perpetuity.